AleaSoft, April 8, 2019. 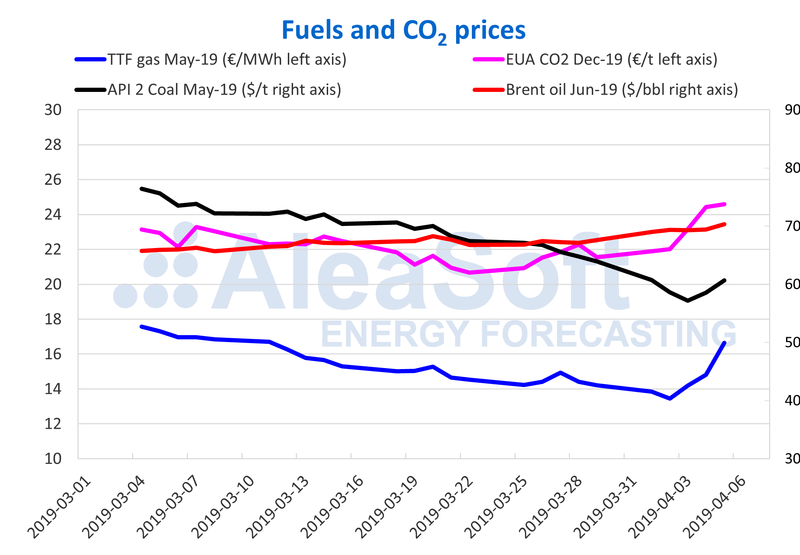 AleaSoft analyses the generalised rise in the markets prices of fuels, CO2 emission rights and European electricity during last week. Brent oil futures prices for June 2019 in the ICE market settled on Friday, April 5, with a price of 70.34 $/bbl, breaking the 70 $/bbl barrier with values that were not reached since first half of November last year. This continues the price rise that began at the end of last year when minimum values of 51.57 $/bbl were reached. 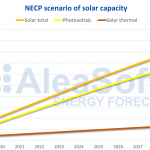 At AleaSoft we consider that this value of 70 $/bbl is a bound and that the price will remain in that environment depending on the stability of the international situation, to which is now added to the tensions in Libya, the OPEP policy of cuts and the strength of the world economy. In the first week of April, the TTF gas futures in the ICE market for May started with a drop down to 13.46 €/MWh on Tuesday, April 2, breaking the record of the last two years. From that moment it begins a recovery, reaching on Friday, April 5, 16.63 €/MWh, which represents a rise of 24% in just three days. The price of API 2 coal futures for the month of May in the ICE market broke last week its record of the lowest value in the last two years, reaching 57.20 $/t on Wednesday, April 3, being the first time it went under 60 $/t in a long time. Like the TTF gas, there was a recovery at the end of the week, in this case less pronounced, until reaching 60.65 $/t. The price of CO2 emission rights futures for the December 2019 reference contract in the EEX market ended last week with a rise to 24.59 €/t, on Friday, April 5 . These values were not reached since January. Among the causes of this rise is the possible extension of Brexit, a situation that should be defined in the coming days. Last week, the first of April, with the increase in CO2 and gas prices, the prices of the main European markets experienced an increase of around 7% compared to the last week of March. As in the previous weeks, the two groups of well-differentiated market prices continue to be observed. In the group with the highest prices are the N2EX markets of Great Britain, the Italian IPEX market and the MIBEL market of Spain and Portugal. This group settled on average on Sunday, April 7, with prices slightly above 50 €/MWh. The Nord Pool market of the Nordic countries and the EPEX SPOT markets of Belgium, the Netherlands, France and Germany continue to have the lowest prices, which are around 40 €/MWh in recent days. It should be noted that prices have been quite similar in all these markets since the beginning of the month. In general, in the last week the electricity demand and temperatures remained stable and for the coming week the same behaviour is expected, except in Italy where a 15% decrease in demand is expected. 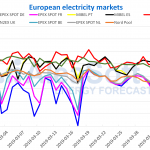 European electricity futures for May 2019 ended last week, on Friday, April 5, with widespread increases of up to 14% of UK futures in the ICE market, driven by the increase in the price of fuels and CO2. This rise comes after some minimum historical settlement prices for the product were reached in the April 2 session, as in the case of the German and French futures in the EEX market, which settled at 35.61 €/MWh and 34.60 €/MWh respectively. In general, wind energy production was lower in the first week of April, compared to the last week of March. 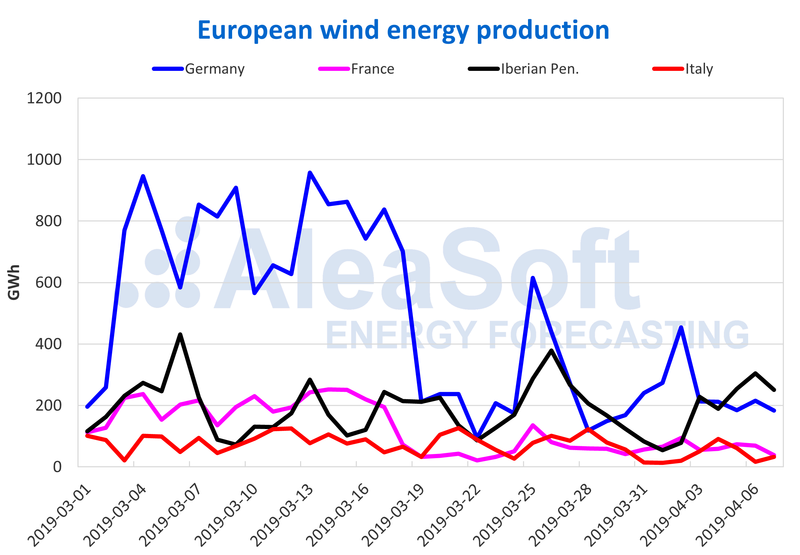 The Italian Peninsula registered the biggest fall among the analysed markets, with 286 GWh produced during the past week, representing practically half of the wind energy produced during the previous week. Portugal was the only analysed country that recorded an increase in wind energy production, of 7.2%, but in the Iberian Peninsula as a whole, the drop was of 10%. 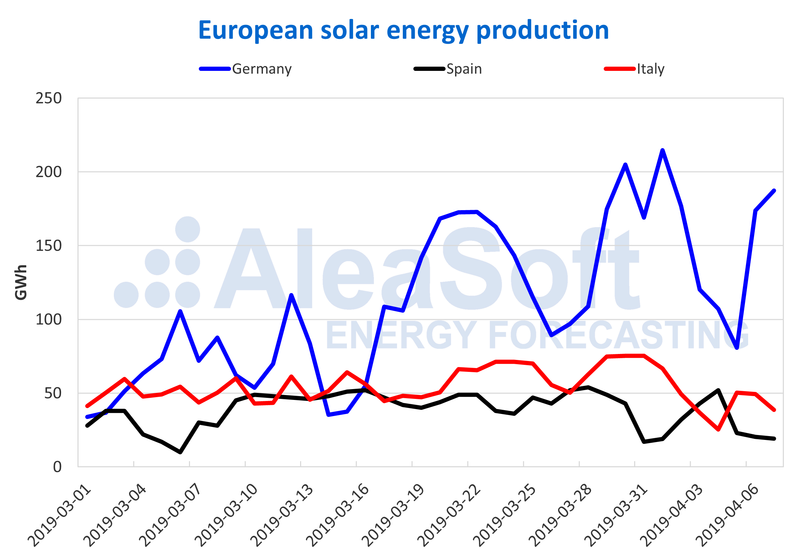 The solar energy production, which includes both photovoltaic and solar thermal technology, last week had an increase in Germany of 11%, while in Spain and Italy it decreased by 32% in both cases.